InSanity lurks Inside: More Details about Universal Orlando's Hogwarts Express Emerge! 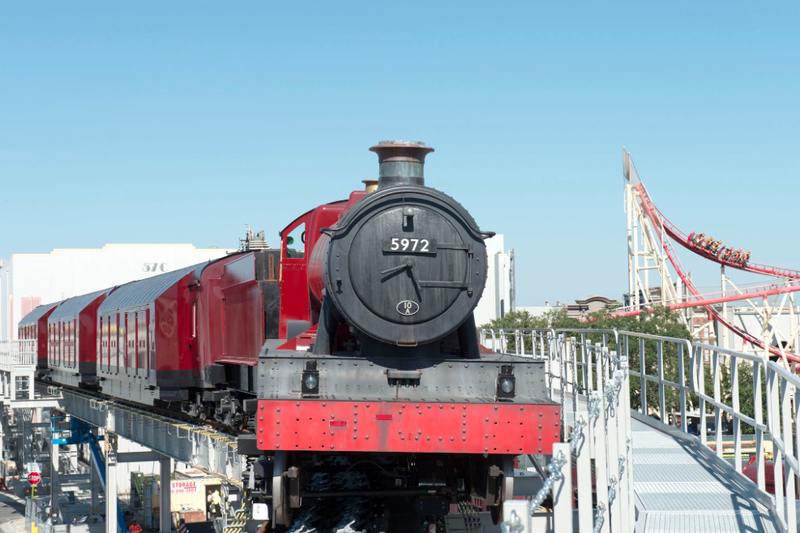 More Details about Universal Orlando's Hogwarts Express Emerge! This past Friday, Universal Orlando finally announced more details about the Hogwarts Express attraction that's part of the new Wizarding World of Harry Potter Diagon Alley expansion. The train, which takes guests from the new Diagon Alley/London to Hogsmeade, will feature a different experience in each direction. Also, important to note here, you WILL need a two park ticket to ride, no exceptions on that one. So, for anyone curious how that would work, there's your answer. What can you expect during your trip? Once on board, the execs were careful to emphasize repeatedly: It is just like the experience of actually riding a train, albeit a magical one. Guests will be able to look out the windows and see an actual Harry Potter scene play out; and depending on where they're seated on the train, and what angle they're looking out the window, the scene will look different. Visits from your favorite characters during the trip, such as Hagrid on his flying motocycle, or Buckbeak the Hoppogriff, the Knight Bus and even a possible visit by a Dementor on the hunt. Sound awesome? Well, there's a lot more to expect. Like, just how you get to the famous Platform 9 3/4. VP of Corporate Communications for Universal, Tom Schroder, had this to say about that,"I don't want to give it away, you have to experience it. But you'll see people... Transition through the wall, and you'll transition through the wall as you go to the platform". You want even more? Well, good thing they spilled the beans further and have said that even the candy trolley, or at least something very similar, will be on board as well! Now, have a look at the First Look video put out by Universal as well as few still of what's being reported as possible scenes that guests will experience while on their journey aboard the Hogwarts Express! And now for the stills, not sure if they're a 100% sure thing, but definitely interesting to see what might be in store for those taking the journey this summer!